Smile: Security people get frowned at all day. Give them a smile. Afterwards - take a break and recombobulate. Do you have any other tips to share? If you are looking for the TSA's official tip list look here. PS - if you have no idea what the references to Recombobulation mean then read this post. Great Post Tim. I was just explaining some of the very same things to a colleague while we were waiting in line at Vancouver Airport. A little bit of preparation and knowing what sets off that darn metal detector can save you a lot of grief. Not to mention, your fellow passengers will be grateful for your speediness. @Stephen - thanks. 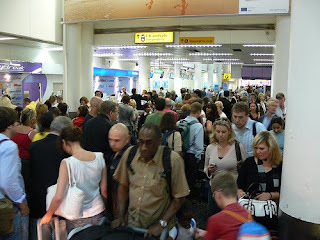 There is a definite community benefit in all travellers doing the little things to get through security fast. As a great speaker once said "Ask not what your fellow traveller can do for you but what can you do for your fellow traveller". Yes, excellent post Tim, thanks. Agree with all here especially the line profiling part. Only thing I'd possibly add is that with the vague'aries of metal detectors, belts sometimes go off and sometimes don't so it's one more thing that goes in the bag with rest (wallet, phone etc). I actually now have a travelling belt which has very minimal metal in it to stay under the aggregate threshold. Also when travelling domestic, where you don't always have to be travelling to go the the gate, I wait until it's my turn and completely clear to walk through the detector before I put my bag on the conveyor for Xray. I've personally seen someone get to the other end and their phone was no longer with their belongings (another reason for strictly adhearing to point 5) but have also heard of someone having a laptop lifted after a (likely manufactured) delay in the line. Less likely with vigilance but possible. Thanks for the tips. Recombobulating has been done with a chuckle since you shared this most excellent word in the previous post. @Stephen J, If you have to be standing in line at an airport Vancouver is definitely one of the nicest. @Carl - great tips re electronics. The security screen area is always chaos and it is too easy for things to get "lost". One of the biggest red flags and will place you on the "extra security search," is ticketing late. If one buys their ticket very last minute sometimes you are automatically placed on the maximal search which we all know is an extra 10 minutes. I have missed flights as a result of this. So many great tips here that we never thought of this is definitely worthy of a printout. @GAT - true. Timing of buying tickets (and if you are on a one way sector) are also important.